Have you heard of Smart Windows? Nearly everyone these days has a smart phone. But what about a smart window? What exactly is that? Smart windows are the future of window technology. They are windows that incorporate solar and heat sensor systems. Switchable glazings (sometimes called “smart windows”) can change properties such as shading coefficients (the amount of solar heat gain allowed) or visible transmittance (amount of visible light that passes through a window) in response to an electric current or to the changing environmental conditions themselves. Electrochromic. These windows can change from clear to near fully dark (or pretty much anywhere in between) at the flip of a switch. A multi-layer assembly of electronic conductors, counter-electrodes and ionic conductors is sandwiched between the two layers of traditional glazing in an IG (insulated glass) unit. Low-voltage current moves ions between the layers, causing the window to change color. Reversing the voltage restores it to its original state. These windows operate on only one to three volts and use energy only to change — not to maintain — any particular state. Photochromic. Like eyeglasses that tint themselves on sunny days, these windows respond to changes in light. This type of technology has some drawbacks in terms of energy efficiency; they do well at controlling glare but are less effective with solar heat gain. When the sun is lower in the sky during winter, its rays will cause the window to darken more than in the summer. This is the exact opposite effect that you would want to control heat gain. Also, while the technology works well on small pieces of glass, it has yet to be successful on a large scale for window-sized pieces. Thermochromic. These windows automatically change from clear to diffused to white and reflective in response to heat. 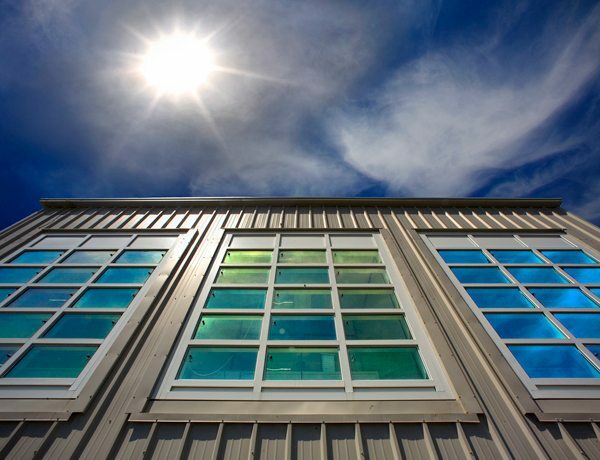 Gel-based coatings are the most promising method of producing thermochromic products, as the response temperatures can be adjusted depending upon need and glazing location on a building. A few products are commercially available, as the gel can be applied to almost any traditional window assembly. Liquid Crystal. These were the first commercially available smart windows and have been used mostly for privacy control, not energy savings. Laminated between two layers of heat-treated glass are two other layers of thin film that encase a layer of tiny liquid crystals. Both faces of the film are covered with a transparent conductive metal coating. In the off position, the glass is a translucent milky white. When an electric current is applied to both layers of film, the crystals align and the glass becomes transparent. The windows let in nearly the same amount of light and heat in either position. While there are only a few manufacturers that offer these technologies now, you can bet that it won’t be long before it becomes more widespread and in demand.